Dr. Lisa Alvetro, 2019 campaign chair, addresses the campaign volunteers prior to the campaign kickoff on Feb. 14. 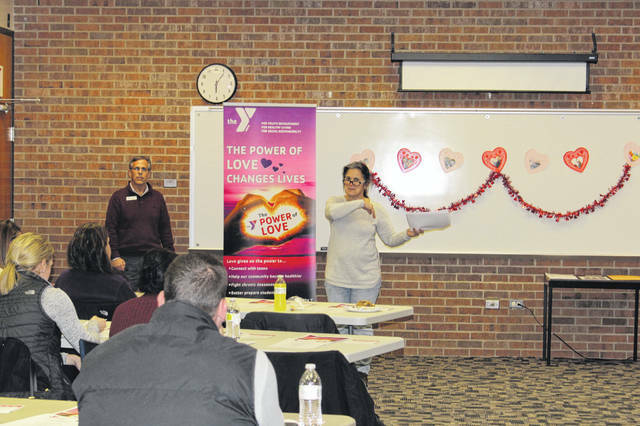 SIDNEY — “The Power of Love” will flow during the Sidney Shelby County YMCA’s annual Community Partners Campaign. The campaign, which will begin Thursday Feb. 14, 2019, at noon at the Y with a catered lunch, will feature inspiring stories of two individuals who have benefitted from Y services this past year. Every day the Y impacts lives in a positive and healthy way; impacting the lives of individuals and families right here in Shelby County. Each year this campaign helps well over 2000 people in our community in need of assistance with health and wellness, youth programming, quality childcare and more. In addition to Alvetro and Shaffer, the 2019 Community Partners Campaign is led by team captains Craig Albers, John Cianciolo, Marisa Couchot, Bridget Davis, Erica Hicks, Melissa Kinninger, Suann Kleinhans, Amy Murray, David O’Leary, Tom Rossman, Aditya Sakhalkar, Kari Stewart, Jeff VanTreese and Miki Voisard with a team of dedicated campaigners supporting the effort. To learn more about how you can support the Y’s cause of strengthening community, contact Mark Kaufman, Financial Development Director, at 937-492-9134 or mkaufman@sidney-ymca.org, or visit www.sidney-ymca.org for more information.